"41AN2-5, Burial F-1" by Timothy K. Perttula and Robert Z. Selden Jr.
DECORATION: The rim has six rectangular-shaped engraved panels defined by excised hour glass-shaped elements or brackets. Within each panel, on the upper and lower parts of the rim, are 14 small pendant triangles. On the body are three repeating engraved concentric circle motifs comprised of five separate circular lines. At the center of these concentric circles is a circle and cross motif. This motif is comprised of intersecting horizontal and vertical lines with four excised triangles pendant from these lines where they meet the central circle. TYPE: Poynor Engraved, PP variety (Kleinschmidt 1982); the rim panel has the Poynor Engraved, var. Freeman motif, but this vessel is not classified as Poynor Engraved, var. Freeman because of the distinctive engraved design on the vessel body. 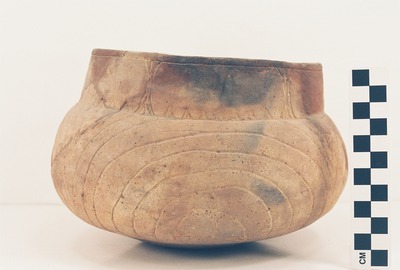 Nevertheless, because of the decorative elements on the rim panel, this vessel from the J. M. Cook site is stylistically related to Poynor Engraved, var. Freeman. Poynor Engraved, PP variety carinated bowl (Vessel 41AN2-5).